Thursday, April 26, 1888 Mild, & still pleasant till clouded over first of eve. All occupied much same with our folks, number of children here to practice singing, both before & after tea. Geo - with Rosa at prayer meeting in eve, Geo- rec'd letter from El- last eve - find he expects to be here May 5th Sat-. Quite as well self, & with usual chores busy at pasteing & fixing up trunk, & boxes somewhat, & knitting. Friday 27 After some rain in night, showers during day, & April like. 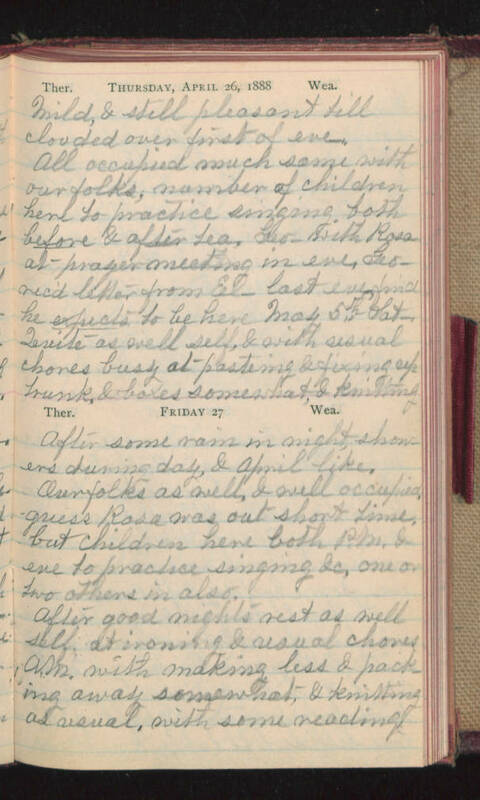 Our folks as well, & well occupied, guess Rosa was out short time, but children here both P.M. & eve to practice singing &c, one or two others in also. After good nights rest as well self, at ironing & usual chores A.M. with making less & packing away somewhat, & knitting as usual, with some reading.